Learning is a social pursuit. Every conversation, every book read, every YouTube video watched is an opportunity for learning from someone else. Occasionally we make an absolutely brand-new discovery, but the value of those discoveries increases once they are shared with others. This has been on my mind near-constantly since joining Twitter and making a point to share my learning online. I encourage my students to learn from each other by sharing their thinking, engaging in Quality Boosters to improve their work, and looking to each other for help. There is a lot of connecting and learning that can happen within our own classroom. If we can learn so much from the people within our classroom, think how much we can learn when we look for ways to connect beyond our classroom walls. We've connected with other classes to play mystery location games, share our thoughts about The Global Read Aloud Books, and learn from experts working in other places. We've also read and commented on blog posts while sharing ours with a larger audience. This is a good start, but how can I truly make connecting and learning a focus for my students? 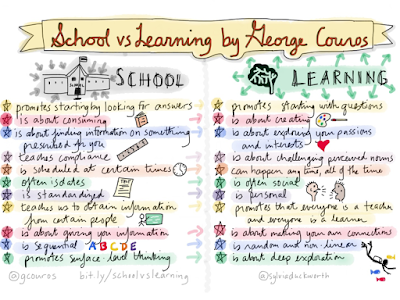 Why is there a divide between school and learning? How can we bring them closer together? A good place to start is recognizing everyone in the classroom as both teacher and a learner. I am proud to be a learner. 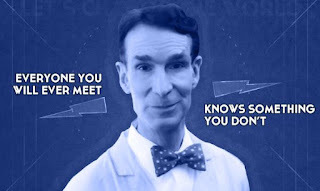 When I try something new, I tell students. where I learned about it and that I am still figuring things out. My students know I learn in and out of school. My students teach me and each other by sharing their thinking. Math classes begin with number talks or Estimation 180 challenges. These always put student thinking front and center. We learn from each other as we listen and consider different approaches. Throughout my classes, students share. This post is part of the Innovator's Mindset MOOC blogging challenge. You can find my other posts related to #IMMOOC here. Two weeks in, and The Innovator's Mindset MOOC is one of the best things I've done since deciding to take control of my own professional development three years ago. 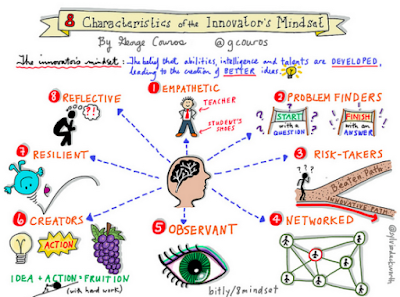 One of this week's blogging prompts was to choose one of the characteristics of the Innovator's Mindset and reflect on what that means for you. As soon as I looked at the sketchnote, I knew I couldn't limit my reflection to just one. Trying to look at school (and especially your own class) with students' eyes can be scary. Does it seem like a safe place? Are the things we do motivating and inspiring? Is there value in what we are doing? I start doing this by picturing myself as a student, but I also ask students for feedback. My goal in this area is to offer more opportunities for truly anonymous feedback so I can better understand how my students feel about my classes. This is how I approach life. Question starts with quest because I am always setting off to find answers or solutions. Helping my students see questions has been a focus of my classes for awhile. My biggest success here has been with three act tasks. Having my students generate questions in math has been a game changer. My attempts at curiosity projects (I've also called it 20% time and passion projects) have always started with student questions as well. Speaking of curiosity projects, that is an area where I have lingering questions and answers to seek. It never works out as well as I want it to. That should be a topic for another blog post. "How you ever gonna know, if you never take the chance?" That line from one of my favorite Garth Brooks songs sums it all up. Ideas are great, but you need to act on them to really make a difference. I'm comfortable telling my students that I'm trying something new and I'm not sure if it will work. We frequently talk about the value of mistakes in my class, and I strive for an environment where no one feels their pride or dignity is at stake when they take a risk. Hopefully the only thing lost in failure is time and pencil lead, but the lessons learned will more than make up for that. Joining Twitter was the best thing I ever did for my teaching career. Being in constant communication with other teachers inspires me to do better and gives me a sounding board for all of my ideas. As a teacher, my best information comes from watching my students. I'm not sure my students are great observers, though. I need to take the power of asking "What did you notice?" to more of my lessons. This goes along with risk taking. You just need to go for it and put your idea in action. The Idaho Kids Vote Book Award is probably my most pressing example of using hard work to drive an idea and action to fruition. It's rewarding to see something come of your idea. Again, this is an area where I need to give my students more opportunities. There are many things created in my class, but more of them need to come from student ideas. Without resiliency, all seven of the other characteristics would fall flat. When things don't work out like you want, you have to be ready to pick yourself up and move forward. Maybe it's time to reflect and create another iteration. Maybe it's time to consider it a lesson learned and try something else entirely. Whatever the next step is, you can't wallow in failure. Things move fast in my classroom, and I think some measure of resiliency comes from not having the time to bog down and lament. Still, this can be a tough one, especially in my advanced learning program. Many of my students are used to doing well at everything they try in school. My classes challenge them and it can be uncomfortable. When I see a student reaching the frustration point where they just can't be resilient, it's time to step in and help with strategies like taking a break or taking stock of the places where they were successful. Hopefully those lessons continue with my students to other areas of their life. I'm writing this, aren't I? My moments of reflection come after every class, and sometimes I manage to get them written down here. For some reason, I have been stuck on the idea that reflection only counts when it is written down. As a result, my students' reflection often gets lost in the mechanics of putting words on a page. I'm trying to make more frequent, shorter reflection a priority. I was able to visit a classroom last week where students rated their learning and performance on a four-point scale throughout the day and had to think about what had to happen for them to move to the next level. That quick reflection was a powerful tool I plan to implement. 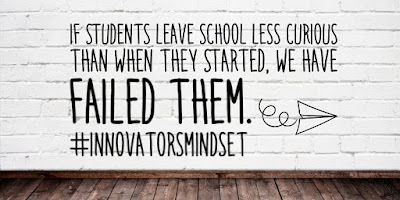 This is the first in a series of posts for the Innovator's Mindset MOOC. 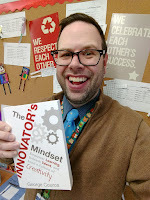 I looked like a bobblehead as I read the introduction to The Innovator's Mindset because I was nodding appreciatively to nearly every sentence. It looks like it will be a great book, and there is still time to join the free MOOC if you are interested. The purpose of education is to build kids into learners and intelligent consumers of information that can adapt to any situation. Our world is constantly changing. Many of the kids I teach will end up working in careers that don’t exist today. When we work to inspire a zeal for learning and help our students develop the tools to evaluate information, connect it to things they already know, and use mistakes to further their learning, we prepare them for whatever their future holds. This was the last thing I wrote before picking up The Innovator's Mindset. Even though it doesn't contain the word innovation, it goes hand in hand with our purpose as educators. When the world changes, schools cannot be stagnant, nor can we expect them to be the sole source of our children's education. Giving students the tools to go on and self-educate requires us to be flexible. We need to adapt to our students' needs like we have always done, but we also have to take into account how our kids can use all of the resources available to meet their needs when they aren't in our classrooms. 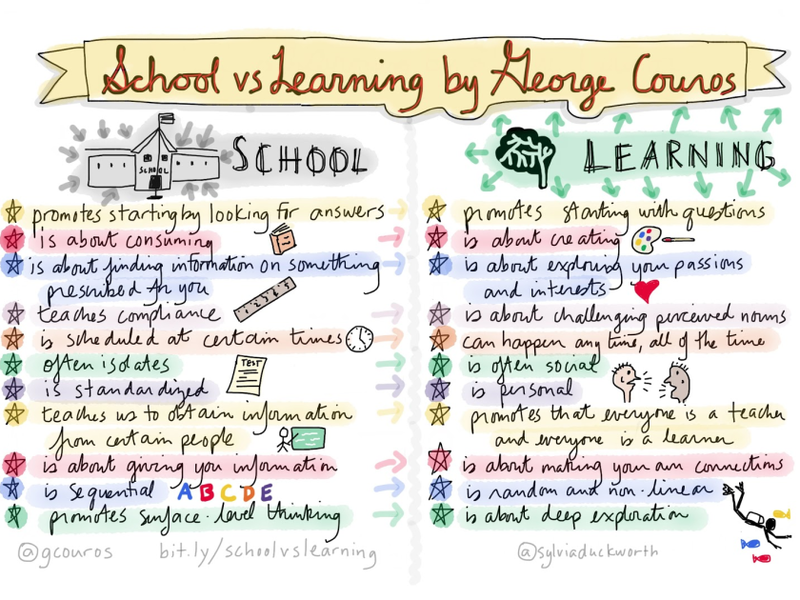 George Couros makes a great point about how we approach new tools in school in the Introduction to The Innovator's Mindset. 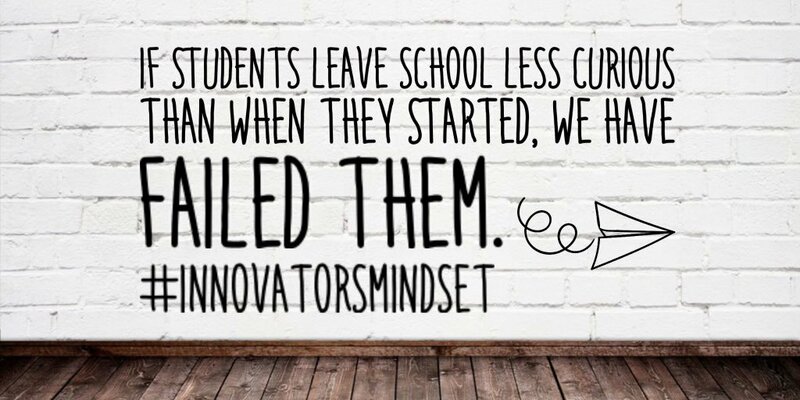 Innovation is all about finding out what you and your students can do. There is absolutely a need to set boundaries, but we can't let them get in the way of the learning our students can do. One of my favorite lessons each year is figuring out the total number of gifts in "The Twelve Days of Christmas." I give my students just enough information to get started and then I get out of their way. They always impress me with the wide variety of strategies they use to figure out the answer. A couple years ago, I extended on this activity by asking them to figure out the approximate cost of the gifts in the 12 Days of Christmas. Since I didn't want my students to find the answer from the Christmas Price Index and I understood that some interpretations of "nine ladies dancing" might be school inappropriate, I gave them a list of sites to use for prices. After working on it for two days, I could see my students were bored and going through the motions without learning much. My fear of inappropriate content and desire to keep students from a readily-available answer cost us a chance for innovation. This year we explored the Christmas Price Index and students created lists of their own modern and extravagant 12 Days of Christmas. They were motivated, they explored, and the project was a success because it was an actual project, not an exercise with one correct answer. One of this week's blog prompts was to share things to include (and leave out) if given the opportunity to develop a school from the ground up. If I were creating my own elementary school, I would begin with an environment where students felt safe and cared about. I am lucky to teach in a school that excels at this, and I think it is the foundation for success in elementary. As a result, I wouldn't change much from the current model of students in classrooms where they can work together with a teacher to build a community of trust, respect, and enthusiasm for learning. I would also continue to give students time with specialists in the arts and physical education. In fact, I would love students to have more time with these specialists and with a librarian who helps instill a love of books and reading. My changes would be in the curriculum and how students share their work. Students need opportunities to use their curiosity. Every classroom would embrace curiosity projects or genius hour and give students time within the school day to explore their own interests. 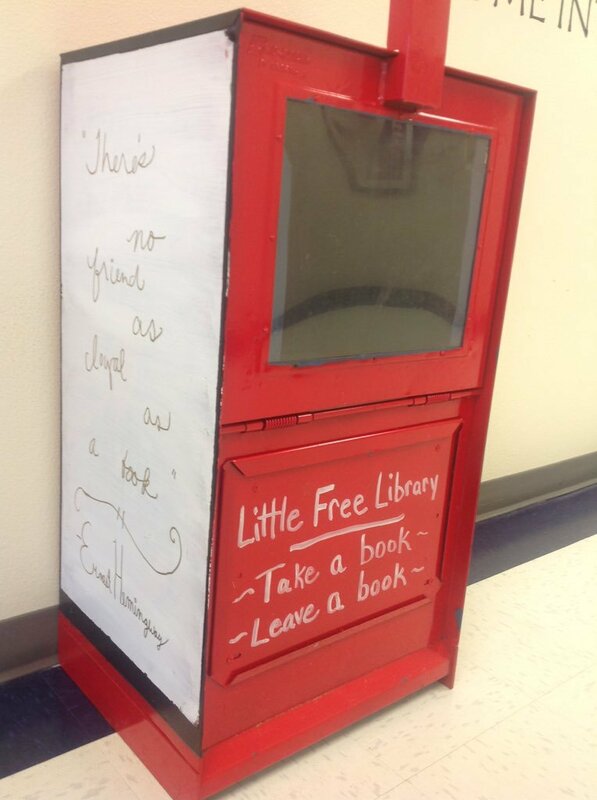 Not only does this give students the opportunity to bring what matters to them into the classroom, it provides real opportunities for them to practice the reading and writing skills they learn. Math instruction would include more problems with multiple answers and paths to get there. Students need opportunities to wrestle with ambiguity and develop their own problem-solving ideas rather than parroting back algorithms and defined steps for problem-solving. The biggest difference between my school and most current schools would be a focus on sharing student work. I've always dreamed of having a school with an on-site museum that was open to the public outside of school hours. It would feature student-created exhibits of all kinds: art, history displays, interactive exhibits, video, and more in addition to temporary hands-on exhibits borrowed from other museums. There would also be a flexible performance space where students could present coffeehouse nights, stage plays and concerts, and hold town hall meetings. In addition to these opportunities to physically share their work with our immediate community, students would be able to share worldwide by posting work online and frequent communication with students in other places. My school would challenge students, nurture their curiosity, and give them opportunities to engage in rich dialogue about their learning with others. 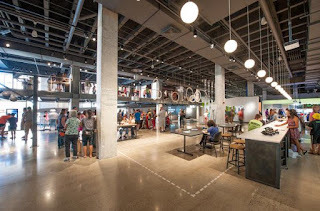 I picture it as a place where students truly get to innovate as they get to use the things they learn to solve problems and make their own creations. This is only a fraction of the thoughts in my head at the end of the first week of #IMMOOC. I can't wait to see where it goes from here!